Matter Three Demo Day. Photo by Matter Ventures. This story originally appeared on the Knight Foundation’s Knight Blog. Matter Three Demo Day from Matter Ventures. Journalists, media makers and tech investors gathered under the high ceilings of a former brass foundry on Thursday for the third demo day from Matter, the San Francisco-based media accelerator. Six startups received five months of financial support, mentorship and a space to refine their visions as part of the accelerator. The event Thursday was a mix between “a graduation ceremony, an investor plan and a real show,” said PRX CEO Jake Shapiro. 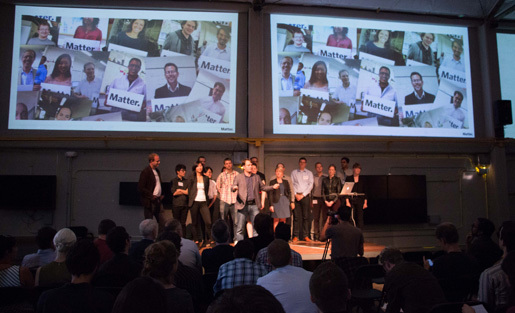 PRX is one of Matter’s three foundational partners, along with KQED and Knight Foundation. Seven-minute pitches from the companies followed. Six startups presented. LocalData, which provides a simple platform for aggregating diverse data from across the Web. CEO Alicia Rouault said that for many analysts the process of collecting and preparing raw data is “an absolute preparation nightmare.” Yet real-time data, from sources such as smartphones, social media and sensor networks, can empower cities and real estate developers to make more informed decisions. Users pay LocalData, a 2012 winner of the Knight News Challenge, to help organize stores of data from disparate sources. The company will launch in San Francisco and New York, and plans to expand to Houston, Washington, D.C., and Seattle as it scales nationally. Stringr’s Lindsay Stewart began her presentation with “really cool drone footage” of a beach in San Diego. Stewart, a veteran of ABC and Fox News, then described the difficulties TV news has in sourcing video: limited in-house resources and difficulty reaching outside videographers. Stringr aims to bridge the gap between media organizations and freelance videographers, allowing organizations to request and license video, and alerting freelancers when a request goes out in their area. Stringr has already launched in San Diego, and the company plans to roll out to a new market each month for the next year. CTO Renato Martins says the service could grow beyond news video to include voiceover and photography gigs. EduCrate aims to give educators a way to find and store videos for their students. Leyla Akincilar, a former English teacher and assistant principal, told the crowd “I’ve been using video to engage and inspire for years.” But the process of discovering Web video—and the inappropriate ads that sometimes play before them—pose a hurdle for educators. EduCrate allows teachers to create lists, or “crates,” of videos for use in the classroom. They can then share their crates with students and other teachers. “Spending less time searching and more time teaching” is how Akincilar put it. The company launched an Indiegogo campaign on Wednesday in partnership with KQED, and had already raised 30 percent of its goal by demo day. Known’s Ben Werdmuller said that students are used to beautifully designed apps on their phones, but struggle with the unglamorous and unwieldy course software at school. Once a class wraps up, the student work on those platforms often disappears. Known’s open source platform seeks to improve on existing systems by allowing students to blog, share notes and submit assignments in one place. Students using Known can send their work to existing portals, such as Moodle. That “puts students at the center of their learning.” Werdmuller said that Known’s applications could reach far beyond education, to journalism and creative media. Louder’s Colin Mutchler called his service “the crowd promotion platform for conversations that matter.” The problem, as Mutchler sees it, is that “as social media has matured, we’ve discovered we actually aren’t reaching the people that we thought we were.” Louder, a recipient earlier this year of a Knight Prototype Fund grant, allows causes to speak through a bigger microphone. It works by allowing Web users to support deserving links across various interest areas. After users vote, Louder will pay to place the most popular content in visible areas of the Internet, such as Twitter’s promoted tweets. The company official launched at the event with partners including 350.org and Fight for the Future. Musey tackles “showrooming,” the problem founder Jude Fulton describes as “checking stuff out in stores and then ordering online.” Musey flips that practice on its head: allowing users to buy the goods they see in a store at that store—but on their phone.. “We take hunting and gathering, put it on crack and push it into the 21st century,” Fulton said. Makers—who produce the products—will get an 80 percent cut, Musey takes 17 percent and the retailer hosting the product gets 3 percent. Musey’s pilot project has 30 locations in San Francisco, offering 200 products. The service hopes to launch within the year. After the presentations, Matter Managing Partner Ford took the stage and told the audience, “Take the time to really get to know these individuals.” A flurry of networking followed; a second Matter Three event will take place in New York on Sept. 16. Aaron Mendelson is a journalist based in Oakland, CA. He has reported for local and national outlets on a wide array of stories, and specializes in audio storytelling and data journalism. Aaron graduated from the UC Berkeley Graduate School of Journalism in May 2014. He is the author of the 2012 book American R&B: Gospel Grooves, Funky Drummers & Soul Power. Some of Aaron’s recent work is collected at this link; his audio stories are available on SoundCloud.